We are deeply concerned about the latest reports of detentions and arrests by Cuban authorities of peaceful civil society members and activists, including Luis Quintana Rodriguez, Antonio Rodiles, Danilo Maldonado, Reinaldo Escobar, Marcelino Abreu Bonora and Eliecer Avila. We strongly condemn the Cuban government’s continued harassment and repeated use of arbitrary detention, at times with violence, to silence critics, disrupt peaceful assembly and freedom expression, and intimidate citizens. 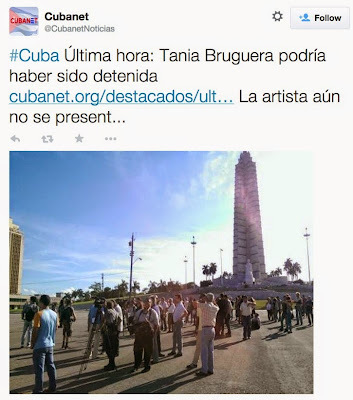 Artist Tania Bruguera may have been arrested today, Cubanet reports. 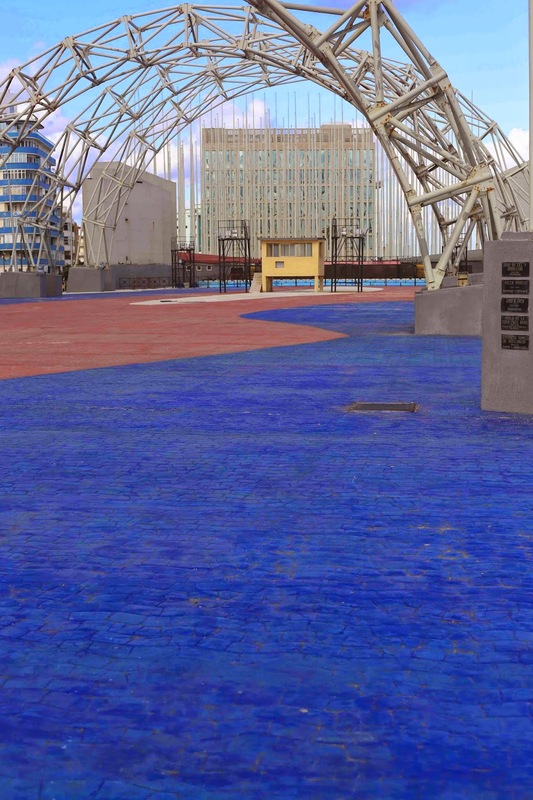 Cuban artist Tania Bruguera has invited Cubans to gather Tuesday at the Plaza de la Revolución in Havana to speak before an open microphone (See press release). 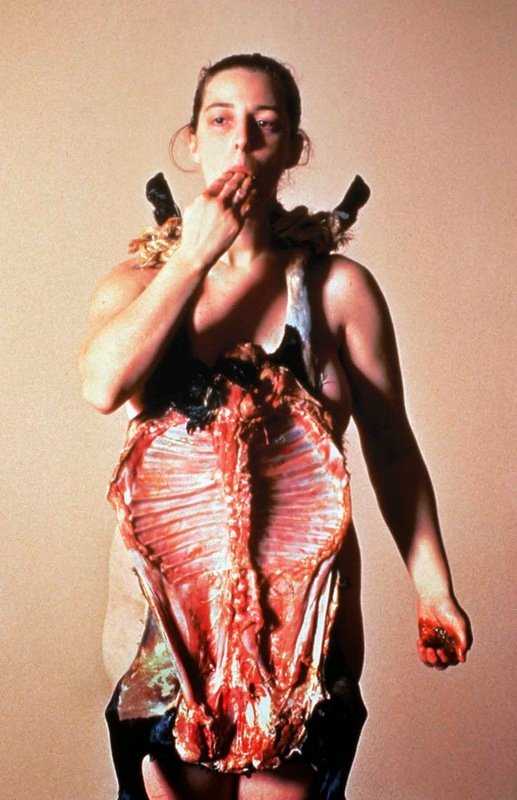 Bruguera, born in Havana in 1968, is a performance and installation artist. One novel past performance involved her covering herself in raw meat. In 2009, she staged an open microphone event in Havana that angered Cuban officials. Speakers at that event included blogger Yoani Sanchez. Following the news of December 17th that stirred our Nation, I sent a letter to the Cuban newspaper, Granma (which, of course, was not published). After its publication by other press media, a group of Cuban citizens with no party affiliation reacted to a phrase in this letter that calls all Cubans to gather next December 30th at La Plaza to speak out at an open microphone. They have created the platform #YoTambienExijo (http://www.facebook.com/YoTambienExijo) to which they have invited me, and so far, it has added more 1000 persons with the common purpose of making real what was kind of a metaphor in my letter or maybe an unconscious desire that slipped out of my mind due to that day's commotion. The State Department on Wednesday announced that it is looking for U.S.- or foreign-based organizations interested in running programs aimed at boosting civil, political and labor rights in Cuba. The department's Bureau of Democracy, Human Rights and Labor expects to award up to $11 million in grants, ranging from $500,000 to $2 million each. Statements of interest from organizations hoping to receive funds are due Feb. 5, 2015. 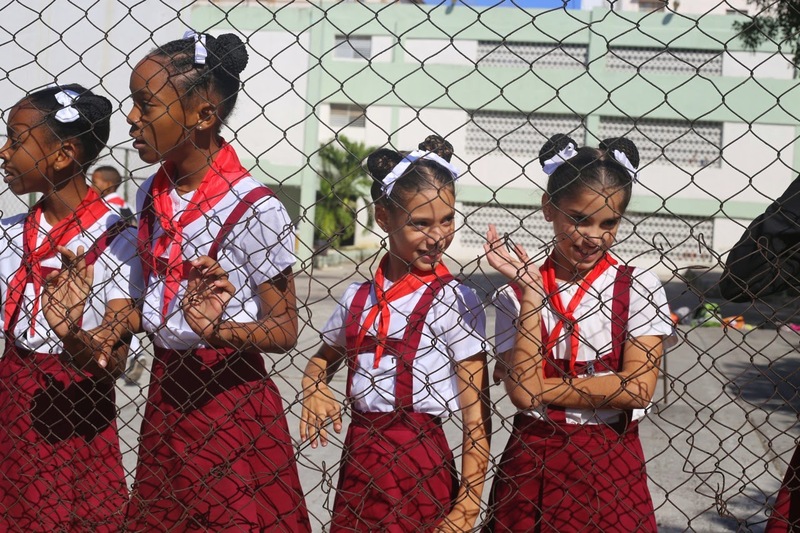 The bureau's announcement says it will give priority to proposals that "emphasize the role of Cuban partners in developing and achieving programmatic objectives." Perhaps that language was added in light of the Obama administration's Dec. 17 decision to pursue diplomatic relations with Cuba. 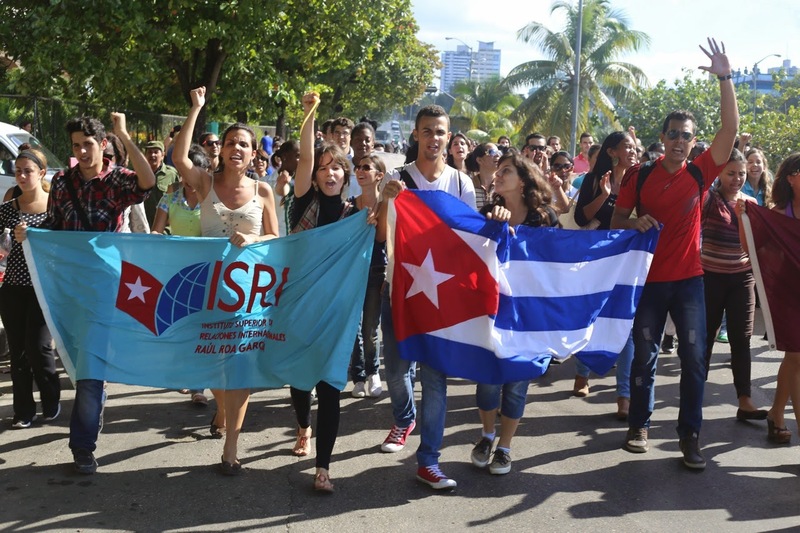 The Bureau of Democracy, Human Rights and Labor (DRL) announces a Request for Statements of Interest (RSOI) from organizations interested in submitting Statements of Interest (SOI) outlining programs that will foster civil, political, and labor rights in Cuba. 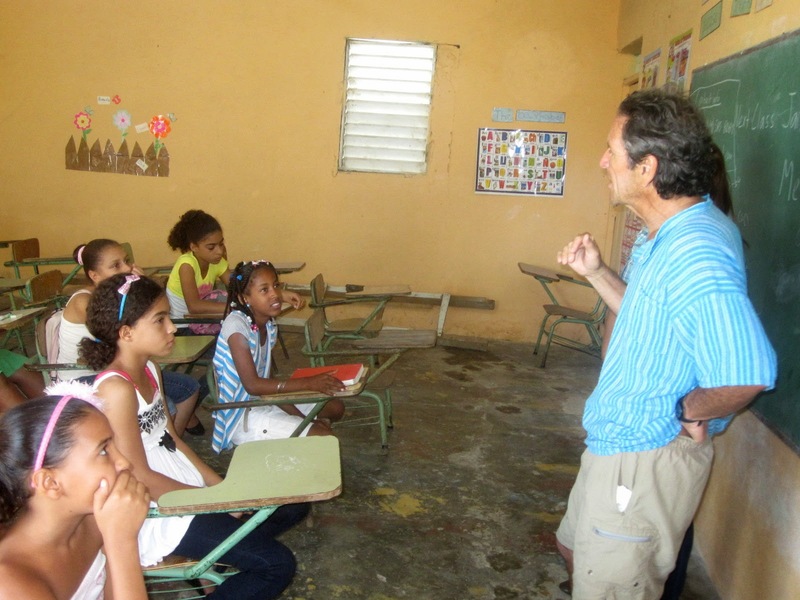 DRL invites organizations to submit SOIs for programs that promote internationally-recognized individual, civil, political, and labor rights - as set forth in the Universal Declaration of Human Rights and other international agreements - in Cuba. The Cuban government fails to respect freedom of speech and the press, restricts internet access, maintains a monopoly on political power and media outlets, circumscribes academic freedom, and maintains some restrictions on the ability of religious groups to meet and worship. The government refuses to recognize non-governmental human rights groups or permit them to function legally. I have been swamped today writing stories about renewed ties between the U.S. and Cuba, but wanted to post a few photos I shot today. 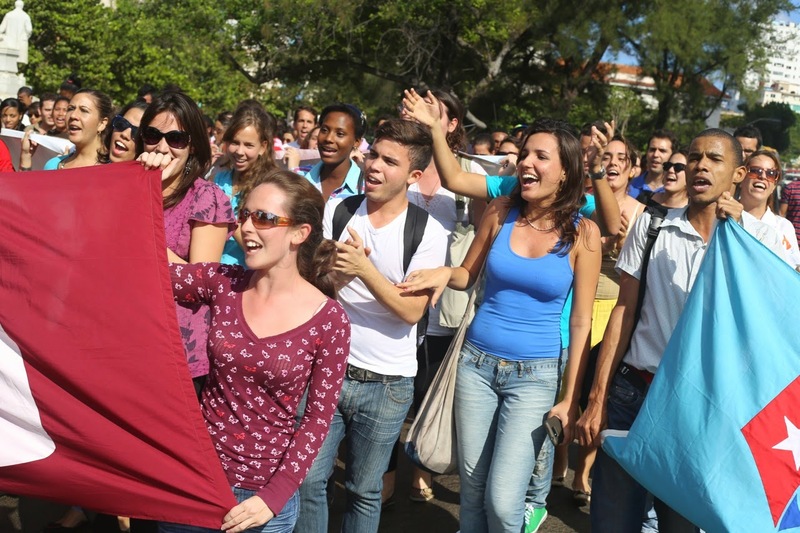 Above, students from Raul Roa Garcia Institute of International Relations in Havana marched in the streets, cheering the return of three Cuban spies held in the U.S.
School children and others came out to watch the marchers. 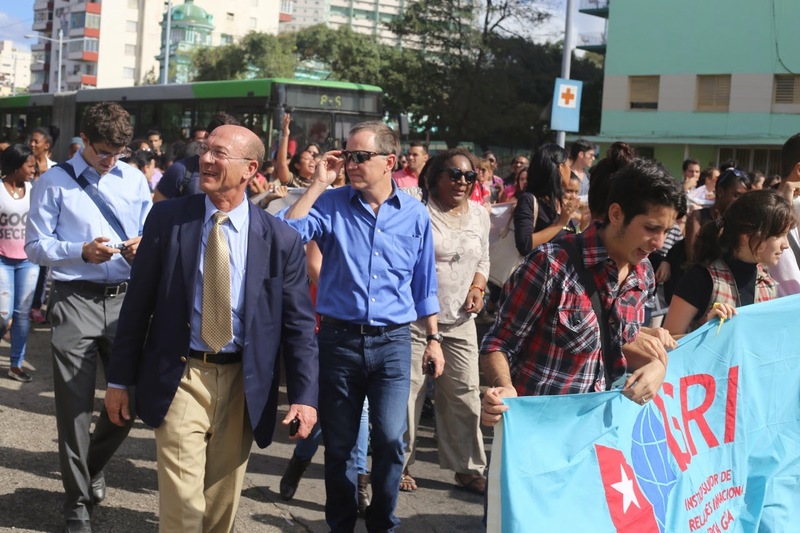 Former U.S. congressmen Mike Kopetski, in Havana for a conference, joined the students. 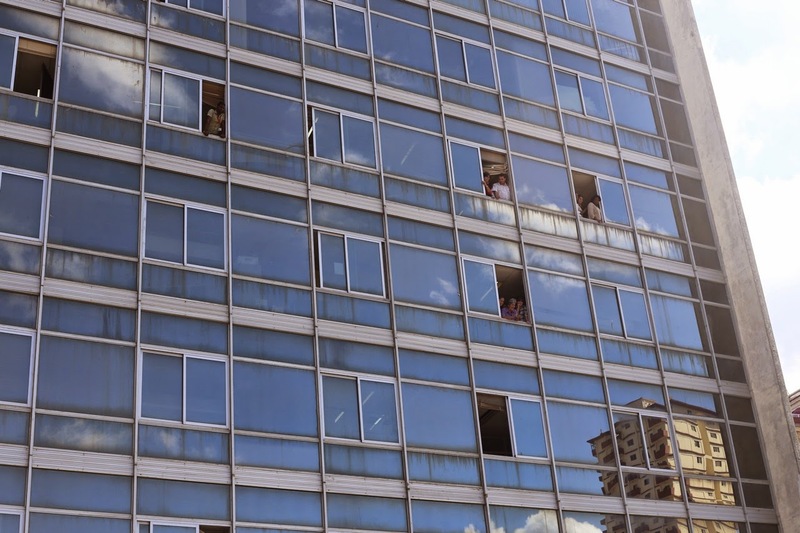 Workers at the Cuban Foreign Ministry peer down at the marchers. The Broadcasting Board of Governors is seeking trainers who can teach mobile reporting, data journalism, use of social media, how to "webify" TV and radio scripts, and multimedia skills. The contractor will train BBG employees in Washington, D.C., and at the Office of Cuba Broadcasting in Miami. Dec. 15 appears to be the application deadline, according to FedBizOpps.gov. USAID’s Office of Transition Initiatives is seeking highly motivated, highly qualified individuals who want the opportunity to help support rapid international transition programs for priority conflict-prone countries. Created in 1994 as a distinct operating unit within USAID, OTI helps local partners advance peace and democracy in politically-transitioning countries. Seizing critical windows of opportunity, OTI works on the ground to provide fast, flexible, short-term assistance targeted at key transition needs. Applicants must be U.S. citizens who are able to obtain a "SECRET" security clearance. Countries experiencing a significant political transition in the midst of a disaster or emerging from civil conflict have unique needs that cannot be fully addressed by traditional disaster relief. Timely and effective assistance to promote and consolidate peaceful, democratic advances can make the difference between a successful or a failed transition. OTI assists in securing peace by aiding indigenous, mostly non-governmental, civil society and media organizations. Congressional leaders late Tuesday came up with a $1.014 trillion spending plan for the 2015 fiscal year, which ends Sept. 30 (see 1,067-page bill). 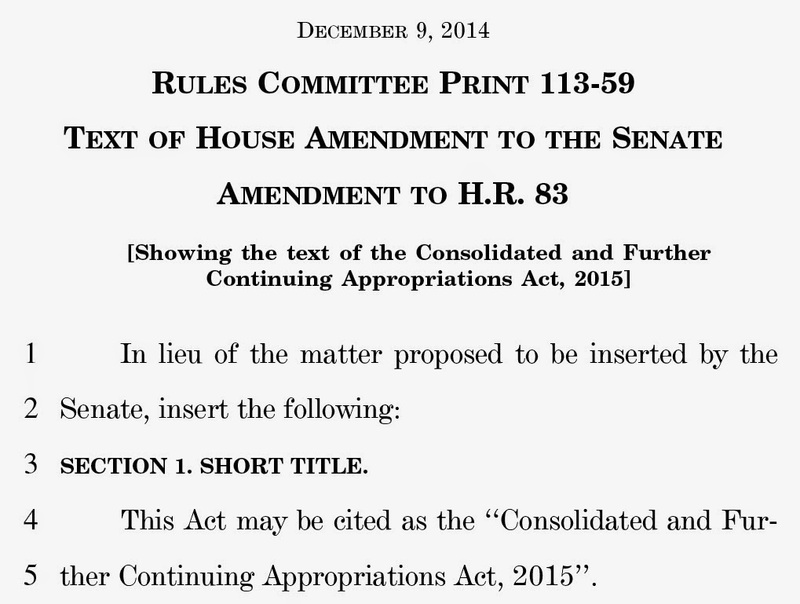 Lawmakers slipped hundreds of so-called "riders" into the bill. These are policy instructions telling federal agencies how to spend the money. 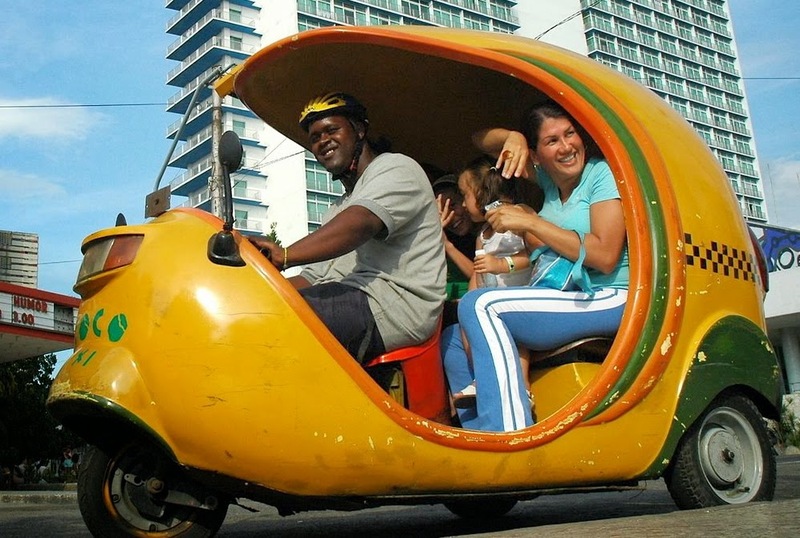 Some of the riders are related to Cuba. $2,632,529,000 in so-called "Economic Support Funds," money that would be available until Sept. 30, 2016. The bill states: "Funds appropriated by this Act under the heading 'Economic Support Fund' should be made available for programs in Cuba." $130,500,000 toward the "Democracy Fund," to be used "for the promotion of democracy globally." Of the total, $75,500,000 would go to the Human Rights and Democracy Fund of the State Department's Bureau of Democracy, Human Rights, and Labor, and $55,000,000 would be steered to the U.S. Agency for International Development's Bureau for Democracy, Conflict, and Humanitarian Assistance. Today is Human Rights Day. This year's theme is that "every day is Human Rights Day." The idea is that "...each one of us, everywhere, at all times is entitled to the full range of human rights, that human rights belong equally to each of us and bind us together as a global community with the same ideals and values," according to United Nations General Assembly, which created Human Rights Day in 1950. The principal human rights abuses were abridgement of the right of citizens to change the government and the use of government threats, extrajudicial physical violence, intimidation, mobs, harassment, and detentions to prevent free expression and peaceful assembly. 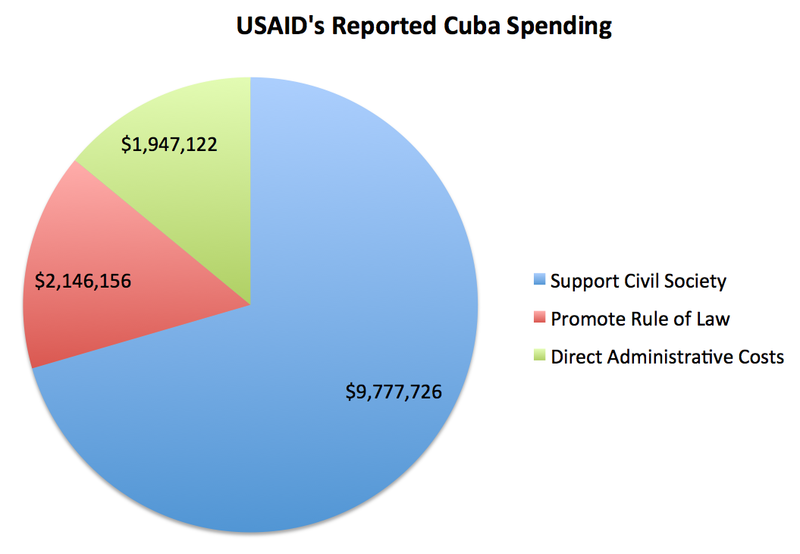 The U.S. Agency for International Development and the State Department are expected to spend $59.3 million on Cuba programs in fiscal years 2013 through 2015. 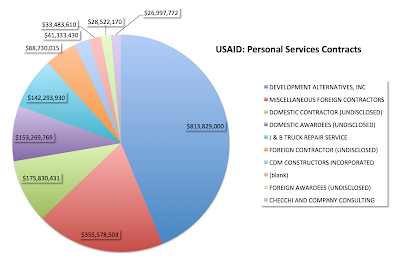 The Foreign Assistance Dashboard website shows how $13,871,004 was spent in fiscal years 2013 and 2014, which covers Oct. 1, 2012, to Sept. 30, 2014. 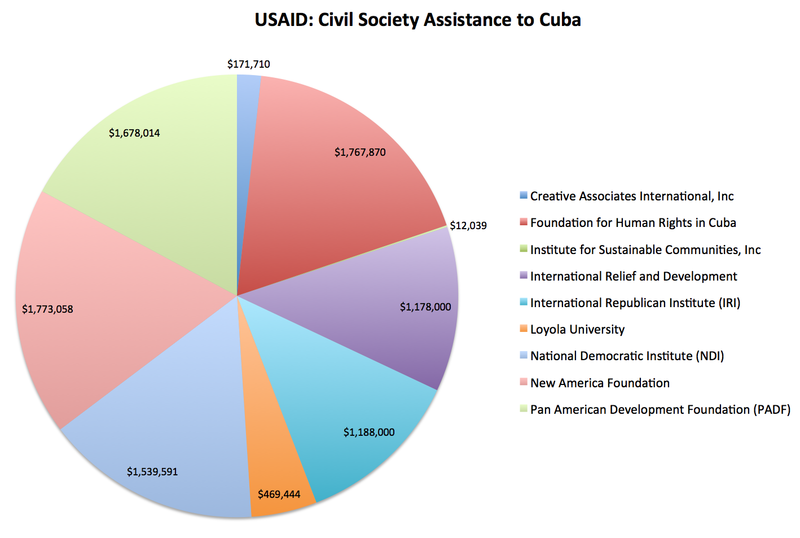 Most of the money - 71 percent - went to support Cuban civil society, according to the dashboard. The dashboard, unveiled in 2012, is a joint project of the Department of State and USAID. The government says it operates under the guidance of National Security staff and shows "where U.S. foreign aid is invested." Nine organizations received funding. The top three were the New America Foundation, the Foundation for Human Rights in Cuba, and the Pan American Development Foundation. Here's an interesting 11-minute video tracing the history of USAID's Office of Transition Initiatives, which celebrated its 20-year anniversary in October. There are 10 oversight committees in the United States Congress that oversee USAID. They don't even talk to each other. They fight with each other all the time. The effect of this is to depress innovation. Anybody does anything that fails, their career is over. Another "window of opportunity" for OTI? Has OTI launched another Cuba project? At least three companies that have carried out democracy projects in Cuba have been awarded contracts as part of a $2.5 billion U.S. government campaign to help promote political change in countries around the world. A little-known agency known as the Office of Transition Initiatives, or OTI, is leading the effort. It is a branch of the U.S. Agency for International Development, or USAID. Unlike its counterparts at USAID, its mission is neither humanitarian nor development-oriented. 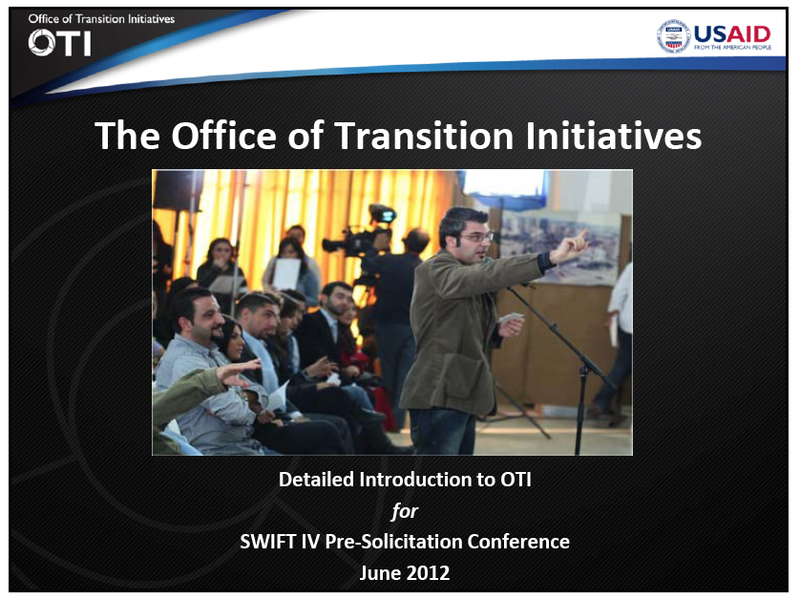 OTI’s activities are overtly political, based on the idea that in the midst of political crisis and instability abroad there are local agents of change whose efforts, when supported by timely and creative U.S. assistance, can tip the balance toward peaceful and democratic outcomes that advance U.S. foreign policy objectives. USAID announced early this year that nine companies had been awarded contracts under an in-house OTI contracting mechanism called Support Which Implements Fast Transitions, or SWIFT. At least three of the firms have done Cuba projects. 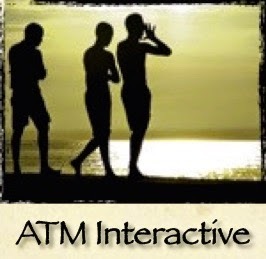 They are Creative Associates International Inc., International Relief and Development Inc., and Development Alternatives Inc., or DAI (See list of winners). DAI is the company that sent development worker Alan Gross to Cuba, a mission that led to his arrest in December 2009. Creative Associates ran a Cuba program from a secret base in Costa Rica. I wrote about that in November 2012 (See "$11 million for clandestine work in Costa Rica?"). In October 2011, I filed three Freedom of Information Act requests for details about Creative's work in Cuba. More than three years later, USAID has not responded, other than acknowledging receipt of my requests. In April 2014, an Associated Press investigation revealed that one of Creative's projects was ZunZuneo, a social networking service targeting Cubans. 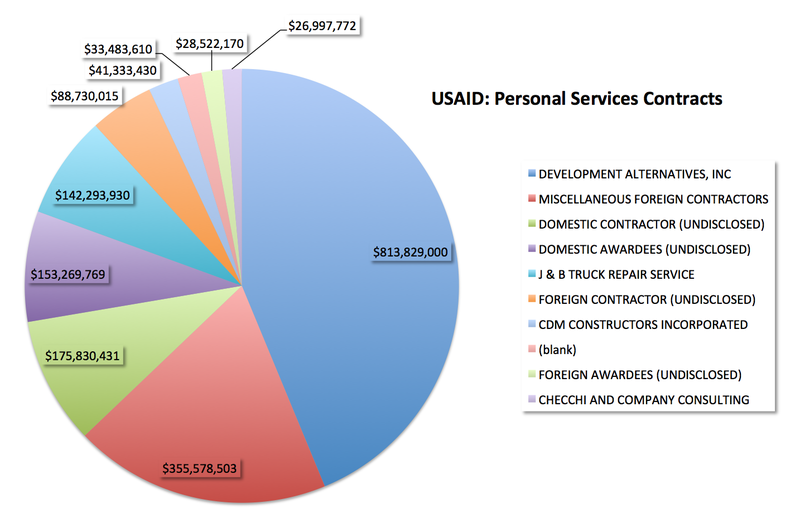 Below is a list of contractors who signed personal services contracts with the U.S. Agency for International Development during fiscal years 2013, 2014 and 2015. Fiscal year 2015 runs from Oct. 1, 2014, to Sept. 30, 2015. The top 10 contracts total $1,859,868,631. Roughly 43 percent of that - $801,930,889 - is listed as miscellaneous or undisclosed. Another 2 percent - $33,483,610 - shows the contractor name as "blank." The total of all contracts signed is $2,180,855,665. 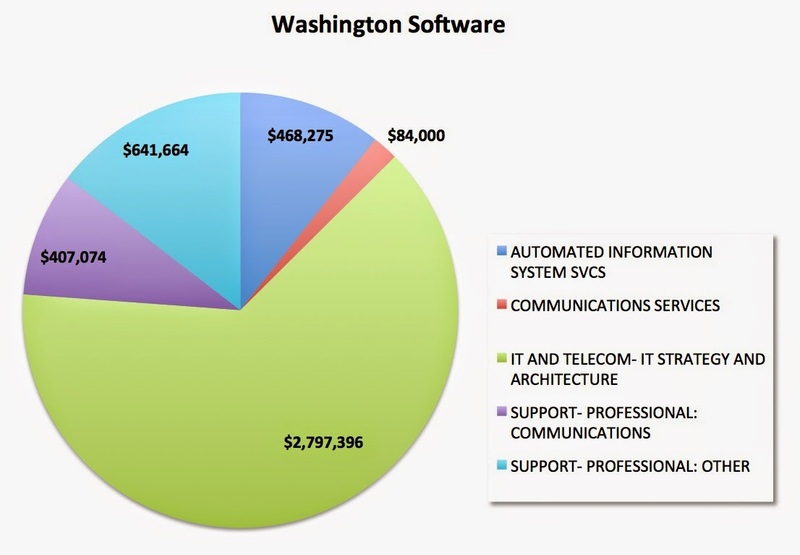 Washington Software, the contractor hired to flood Cuba with email and text messages, has earned more than $1.2 million in government contracts this year, records show. 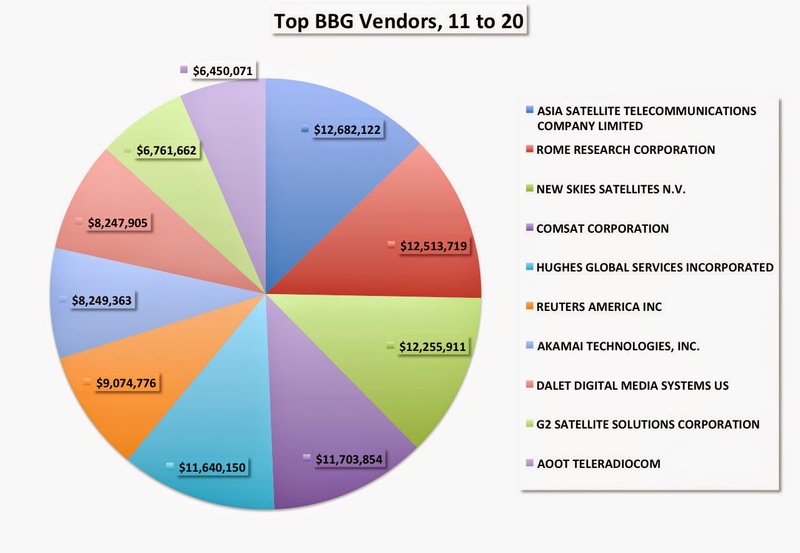 The Broadcasting Board of Governors, or BBG, hired the firm on July 1, 2011. Since then, the BBG has paid the company $4,398,409, according to records found in the Federal Data Procurement System. The BBG oversees the Office of Cuba Broadcasting, which operates Radio & TV Martí in Miami. Designing and operating a Short Message Service, or SMS, social network. Coming up with ways to prevent the Cuban government from jamming its electronic messages. 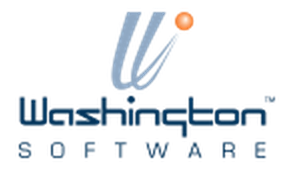 Washington Software is based in Germantown, Md. Ex-CIA agent pursues "new model of journalism"
For clients "seeking to alter their tactical or strategic operational environments"
A former CIA agent's Virginia company has earned nearly $1 million in contracts with the Broadcasting Board of Governors, or BBG, since November 2011, records show. 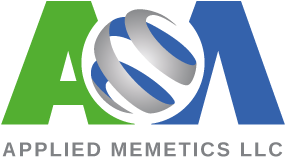 That would put the firm, Applied Memetics, in the top spot in earnings in the category of "independent artists, writers and performers." (See "18 million to unnamed foreign contractors"). 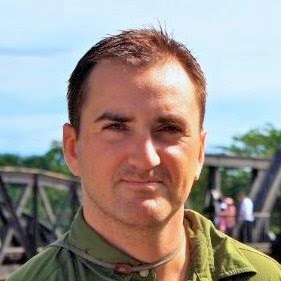 Dan Gabriel, a former covert action officer who served in Iraq and Afghanistan, is the founding partner and CEO of Applied Memetics in Arlington, Va. I wrote about Gabriel in November 2012 (See "Ex-CIA agent leads new team of journalists in Cuba") and in December 2012 (See "More work for ex-CIA agent"). Mr. Gabriel helped pioneer the use of social media in war-fighting and political conflict, and he was an early advocate for incorporating social media metrics into predictive intelligence and risk analysis. He is a subject matter expert and original researcher of interactive digital media strategies, social network analysis, international media research, text analytics, latent semantic indexing, strategic planning techniques, operational and organizational design, and complex system dynamics. Our work explores a new model of journalism that is based around a global story – in this case, the struggle for human rights and democracy around the world. Our goal is to build a better user experience of these stories by adding context to content, using the latest digital tools of the day. Over time, we hope to add greater clarity, deeper understanding, and more sustained engagement to the conversations surrounding global events. 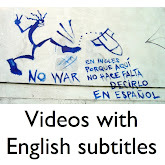 As such, our content is transcribed and translated into English for broadcast to a global audience. 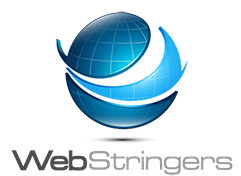 Web Stringers highlights videos produced in the field. 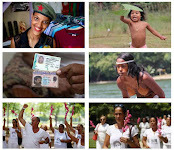 You can watch a selection of the site's Cuba videos at a YouTube channel called Havana Spring. The Broadcasting Board of Governors has shelled out at least $69 million to artists, writers and performers since 1983 and more than a quarter of the payments have been to undisclosed foreign entities, records show. The figures are based on data that the BBG has reported to the Federal Procurement Data System, or FPDS. It's not uncommon for federal agencies to misreport or underreport data, so these numbers can't be considered flawless, but the numbers do provide some insight into BBG spending. The BBG oversees the Office of Cuba Broadcasting, which runs Radio & TV Martí in Miami. To come up with the totals, I analyzed 17,868 transactions carried out from 1983, when Radio Martí was founded, through today. I looked only for payments to independent artists, writers and performers, which includes a range of professionals, including producers, recording technicians, speakers, journalists and others. 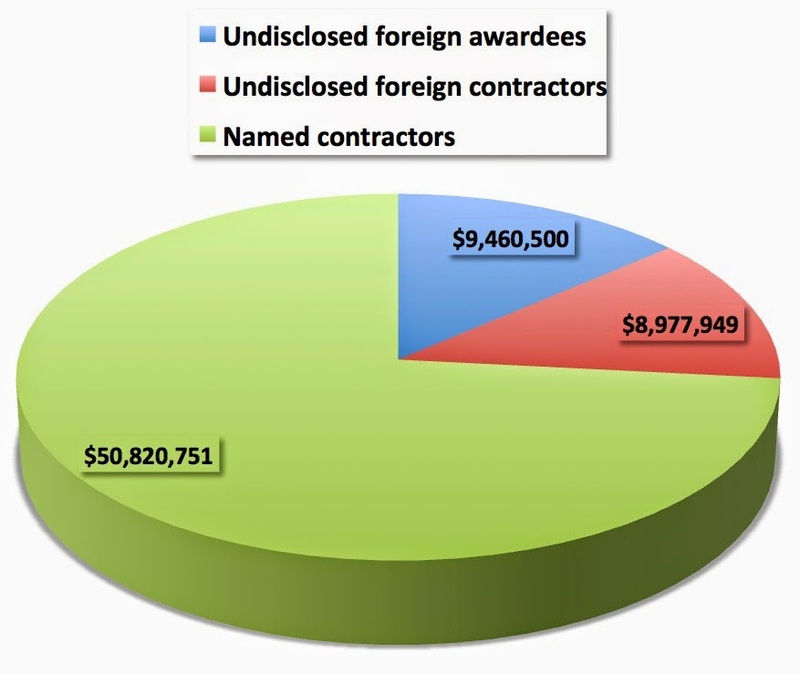 The payments to unnamed foreign awardees and contractors totaled $18,438,449. The full list of payments to more than 1,400 individuals and companies is below. These aren't annual salaries. They are the total payments received since 1983. 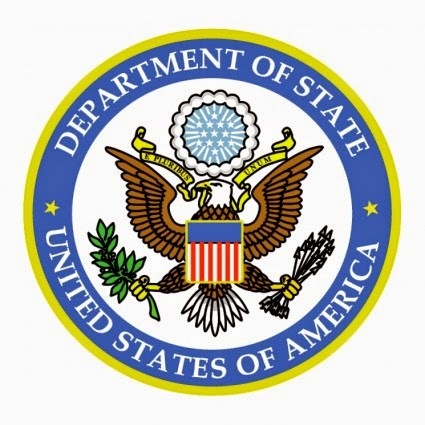 State Department contractors have until Dec. 5 to apply for grants for Internet freedom programs aimed at any region or country, including Cuba. The State Department's Bureau of Democracy, Human Rights, and Labor will choose the winners. Projects should be designed for "long-term sustainability," fitting with what the bureau describes as its "venture-capital style approach to Internet freedom." Individual grants will range from $500,000 to $2.5 million. Some $18 million is up for grabs. The Bureau of Democracy, Human Rights, and Labor (DRL) announces the availability of funding for programs that support Internet freedom. DRL’s goal is to promote fundamental freedoms, human rights, and the free flow of information online through integrated support for anti-censorship and secure communications technology, advocacy, digital safety, and research. DRL invites organizations interested in potential funding to submit statements of interest (SOI) outlining program concepts that reflect this goal. 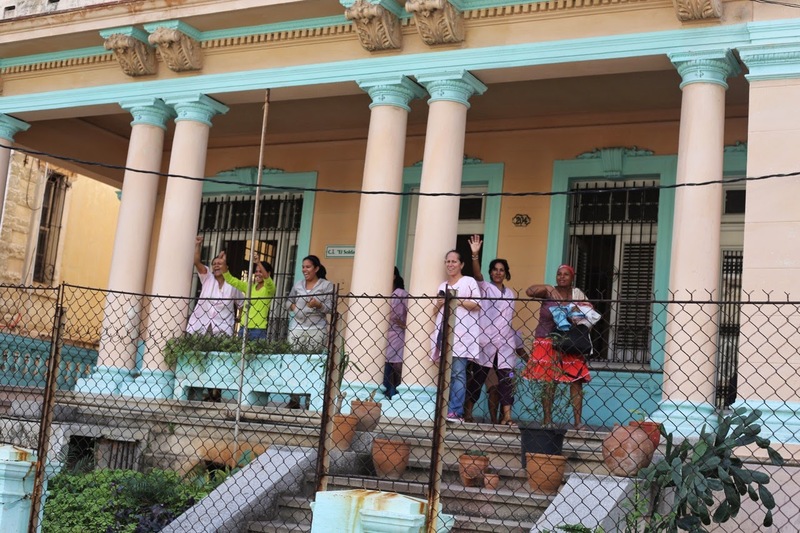 Inspectors visiting the Office of Cuba Broadcasting found low morale, a lack of transparency in decision making, administrative weaknesses, security lapses and one instance of property theft. An Inspector General's report casts a negative light on the agency's leaders, including Director Carlos A. Garcia-Perez, who took charge four years ago this month. The 34-page report also provides interesting details about the agency's efforts in Cuba. It says the OCB has "engaged in an aggressive campaign to distribute weekly its television programming content via broadcast, Internet, and even hand-to-hand, via digital video disks (DVD) and flash drives." Delivers to Cuba every week 1,000 DVDs containing TV Martí programming. Distributes paper flash drives equipped with a tiny electronic interface that allows the sharing of data. Sends a biweekly newsletter called El Pitirre to more than 75,000 email addresses in Cuba. 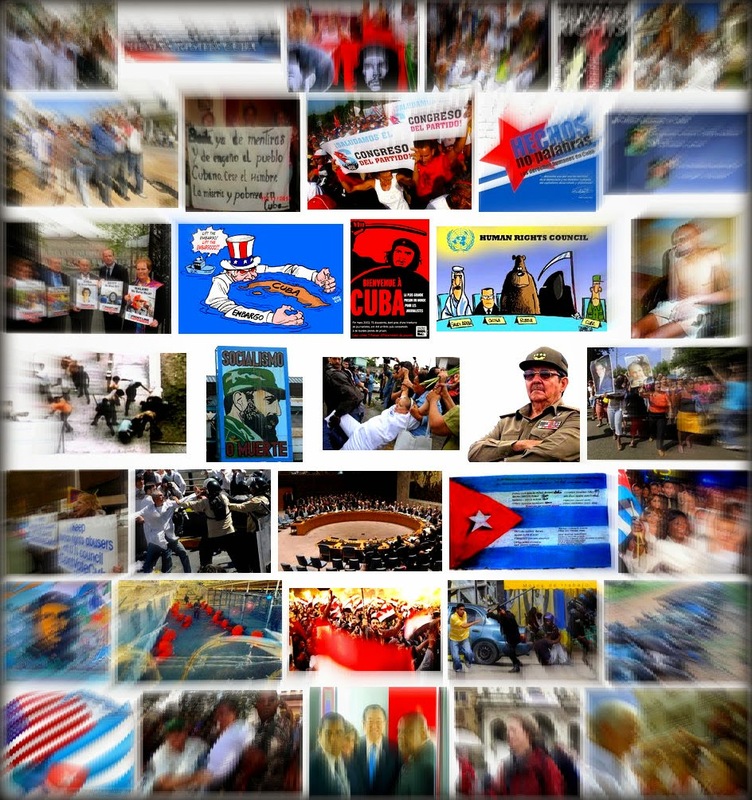 Operates Piramideo, an SMS-based social network that operates outside Cuban government control. The report says OCB managers envision redirecting many of their resources from Miami to Havana if the Cuban government allows them to operate on the island at some point in the future. 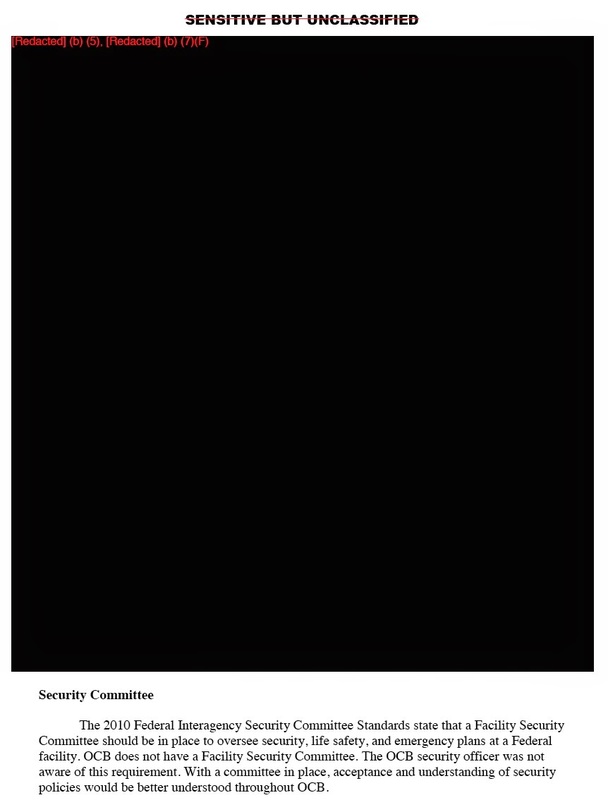 Pages dealing with the security problems are heavily redacted. The Office of Cuba Broadcasting has focused its programming on subjects, such as news, sports, and entertainment that are generally censored by the Cuban Government. 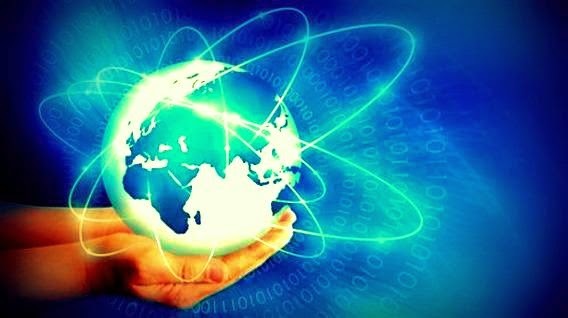 Besides radio (shortwave and mediumwave) and television platforms, the entity has made its digital platforms more robust, going beyond the news Web site by making available and distributing its programming in Cuba through innovative programs. The Office of Cuba Broadcasting is implementing successfully the Broadcasting Board of Governors’ 5-year strategic plan for 2012 through 2016, Impact through Innovation and Integration, and its own programming goals. Employee morale is a concern. Office of Cuba Broadcasting staff expressed that the current management does not communicate effectively and the decision-making processes lack transparency. Many employees expressed fear of reprisal by management if they raise concerns. 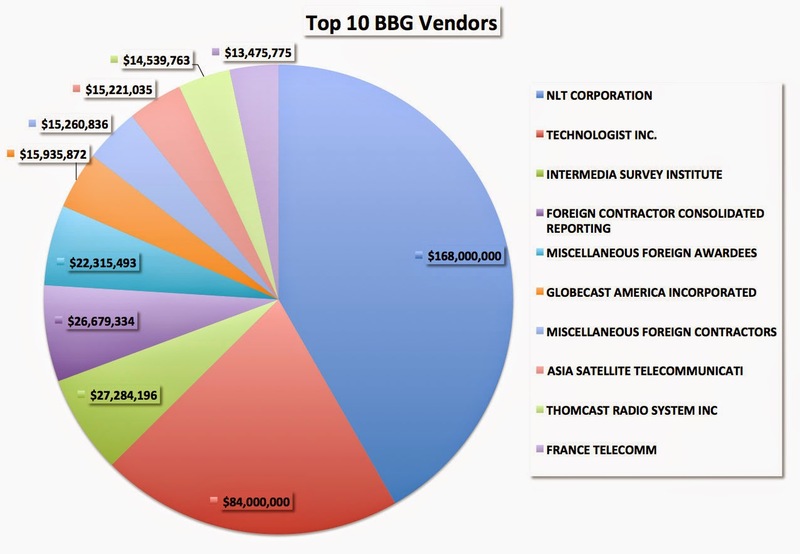 Here are the Broadcasting Board of Governors' top 100 contractors based on data the agency reported to the Federal Data Procurement System between Oct. 15, 1999, and Nov. 26, 2014. To come up with this list, I sorted through 72,482 BBG transactions listed on the FDPS website and pulled out all transactions worth $100,000 or above. That totaled 1,007 transactions worth $715,631,939. I went through those contracts and pulled out the top 100 vendors. 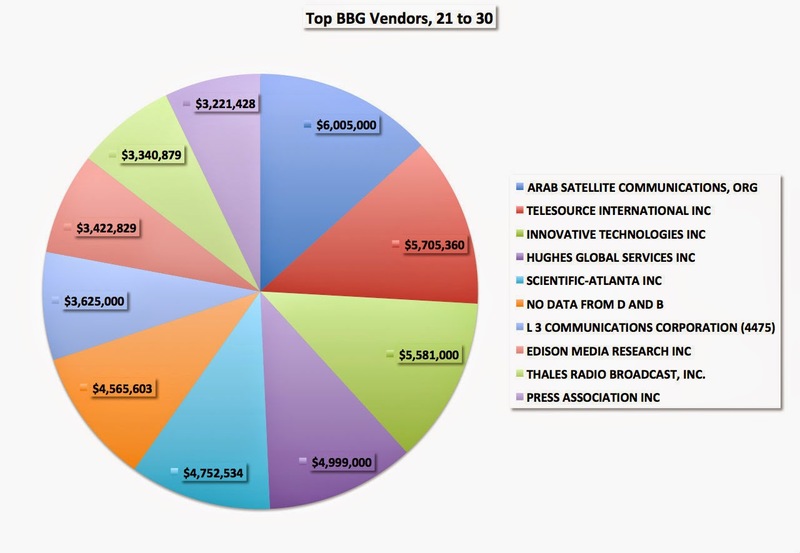 These numbers are only as good as what the BBG reports to the Federal Data Procurement System. There is underreporting of data throughout the federal government. And some reporting appears to be incomplete. The purported vendor ranked No. 37, for instance, is shown as "blank." That means $2,616,700 in contracts were reported without a company name. No. 26 simply reads "No data from D and B." 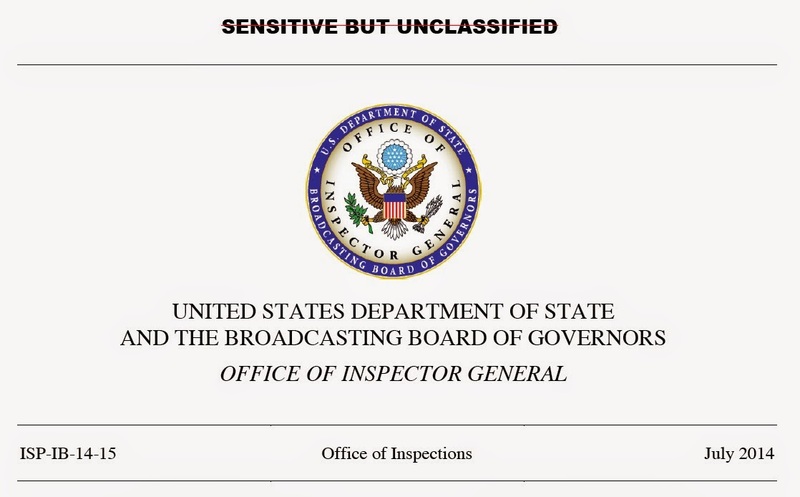 In government lingo, that means the information was sensitive or unavailable. So taxpayers have no idea what happened to that piece of the pie, worth $4,565,603. Even so, this Top 100 list gives you a glimpse of BBG's biggest vendors over the past 15 years. Jeff Kline. Photo: The Good Samaritan Inc. The U.S. government has awarded a no-bid $1.4 million contract to a company that will produce "TV and radio programs designed specifically for audiences in Cuba." The contract went to Canyon Communications, founded by Jeff Kline. The Office of Cuba Broadcasting said it awarded the contract without a competitive bid because Canyon Communications was uniquely qualified for the job. Based on the needs of the Office of Cuba Broadcasting (OCB), Canyon Communications is the only known source with the demonstrated ability to produce programming specifically designed for a Cuban audience. In the opinion and to the knowledge of the government evaluator, the contractor is uniquely qualified to deliver this programming due to their extensive experience in this area, including successful performance under a previous OCB contract last year, which was awarded based on the contractor’s unsolicited proposal. Kline is a longtime government contractor who has worked for the Health and Human Services Department, the Labor Department and other agencies. Lately, he's been doing projects for the Broadcasting Board of Governors, or BBG, which oversees the Office of Cuba Broadcasting, including Radio & TV Martí in Miami. In October, I wrote about a radio programming contest that Kline ran in Cuba without telling participants that it was funded by the U.S. government. The contest was aborted and no one was awarded any prizes after Cuban authorities arrested development worker Alan Gross in December 2009. (See "Taxpayer Contest Aborted"). Earlier, in May 2014, I wrote that that Kline had traveled to Cuba to test cell phones and other wireless devices for a State Department contractor. (See "The Other Alan Gross"). 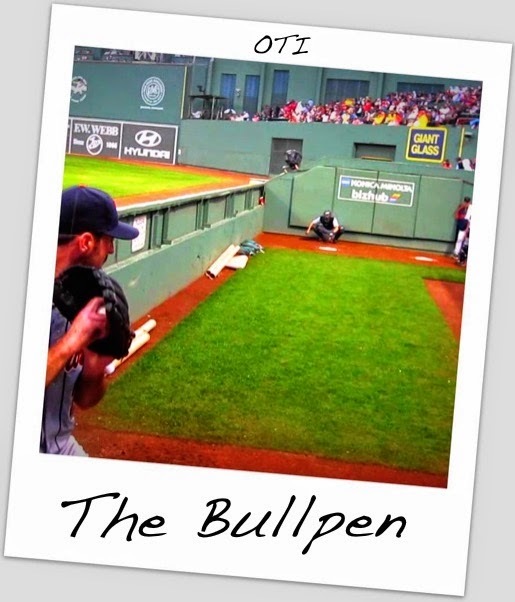 In February 2014, I wrote about his contract to produce self-help videos in Cuba. (See “The incredible disappearing $450,000 contract”). Kline's company, Canyon Communications, signed the $1,450,063 BBG contract on Sept. 30, 2014. His company has won a total of $1,799,503 in BBG contracts since 2013. That makes him the BBG's 56th winningest vendor since 1999. (Another one of his companies, the Pinyon Foundation, won an additional $450,000 in 2013 - see record. Canyon Communications appears to have carried out that contract, documents show. That would bring the company's total contracts to $2,249,503, which would boost Kline's rank on the top 100 list to 44. See Top 100 here). Cars head toward the Plaza de la Revolución in Havana. 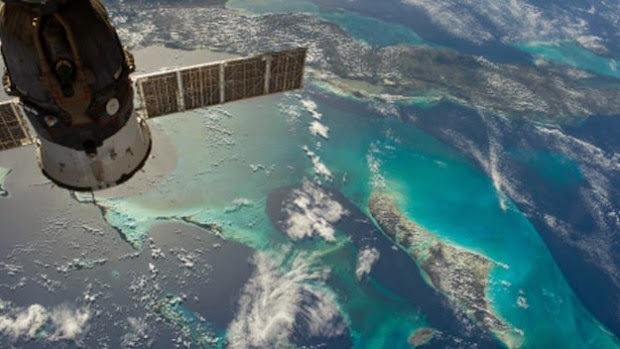 The objective in leasing these broadcast services is to leverage the signal quality of Satellite Radio to reach the Agency’s audience in Cuba. The time required by the Office of Cuba broadcasting (OCB), also located in Miami, FL for having its Radio Marti programming to be rebroadcast from a Satellite Radio station is a two hour block between the hours of 9:00pm – 11:00pm ( Monday – Friday). (ii) Solicitation No. BBG50-R-15-0003 is issued as a Request For Proposal (RFP) and a contract will be awarded using the contracting by negotiation procedures in FAR Part 15. A woman who sued a USAID contractor for sexual harassment in Venezuela lost her case on appeal, court documents show. Heather Rome had worked for Development Alternatives Inc., the same company that sent American development worker Alan Gross to Cuba. Rome was based in Caracas, where DAI was carrying out a project aimed at undermining the government of Hugo Chavez. In 2011, she accused the head of DAI's Venezuela project, Eduardo Fernandez, of misogynistic conduct, according to her lawsuit, filed on Oct. 18, 2011. Rome said Fernandez harassed and screamed at female subordinates and complained that their office was "as inefficient as a brothel." I came across this report today while catching up on some reading. The State Department's Bureau for International Narcotics and Law Enforcement Affairs released the report in March 2014. Despite its location between some of the largest exporters of illegal drugs in the hemisphere and the U.S. market, Cuba is not a major consumer, producer, or transit point of illicit narcotics. Cuba’s intensive security presence and bilateral interdiction efforts have effectively reduced the available supply of narcotics on the island and prevented traffickers from establishing a foothold. The Cuban Border Guard (TGF) maintains an active presence along Cuba’s coastal perimeter and conducts maritime counternarcotics operations and patrols. As such, traffickers typically attempt to avoid Cuban and U.S. counternarcotics patrol vessels and aircraft by skirting Cuba’s territorial waters. Cuba’s domestic drug production and consumption remain low due to active policing, harsh sentencing, very low consumer disposable income and limited opportunities to produce illegal drugs, either synthetic or organic. 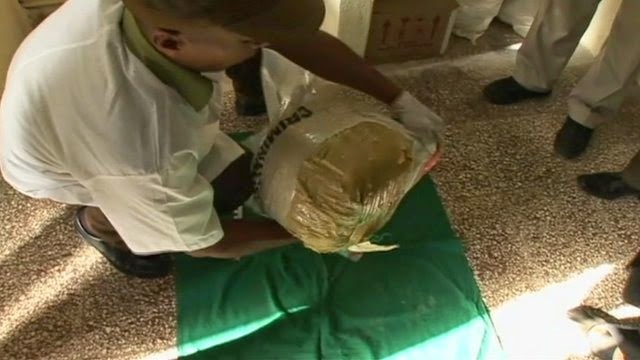 Cuba’s counternarcotics efforts have prevented illegal narcotics trafficking from having a significant impact on the island. Cuban journalists, professors to visit U.S.
Nine Cuban journalists and scholars plan to visit California State University, Fullerton, for 10 days starting on Dec. 3. The visitors plan to get a first-hand look at digital journalism. They'll talk to American journalists and professors. They'll examine the rise of social media in journalism. Some will even do some reporting, a Cal-State source says. Cal-State scholars, for their part, are interested in assessing changes in Cuban journalism, among other things. The December visit is a first step toward a full-scale university exchange. Raúl Garcés Corra, dean of faculty of communication at the University of Havana. Deborah Torres Ponjuán, vice dean for information technology and development at the University of Havana. Beatriz Pérez Alonso, a University of Havana communication professor and former chief editor of Cubahora digital magazine. Maribel Acosta Damas, head of the journalism department at the University of Havana. 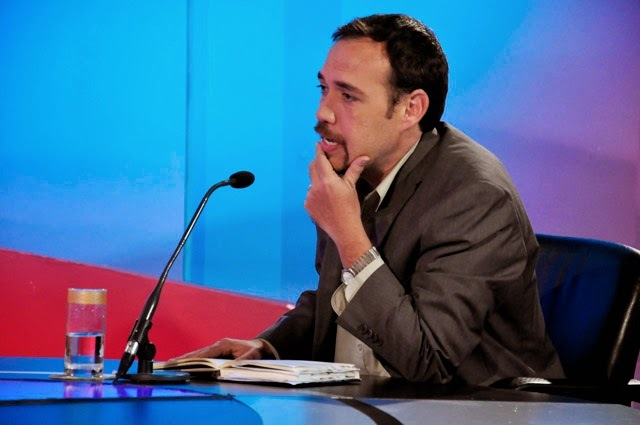 Miguel Ernesto Gomez Masjuan, a journalist, blogger, screenwriter and faculty member at the University of Havana. Liliam Marrero Santana, a professor in the New Technologies Department at the José Martí International Institute of Journalism. Fidel A. Rodríguez Fernández, also a professor in the New Technologies Department at the José Martí International Institute of Journalism. Sergio Alejandro Gomez, international editor of Granma newspaper. Cristina Escobar Dominguez, a reporter, commentator and broadcaster who anchors a talk show about journalism in Cuba. Yet another setback for Alan Gross: He lost his appeal in his suit against the U.S. government. 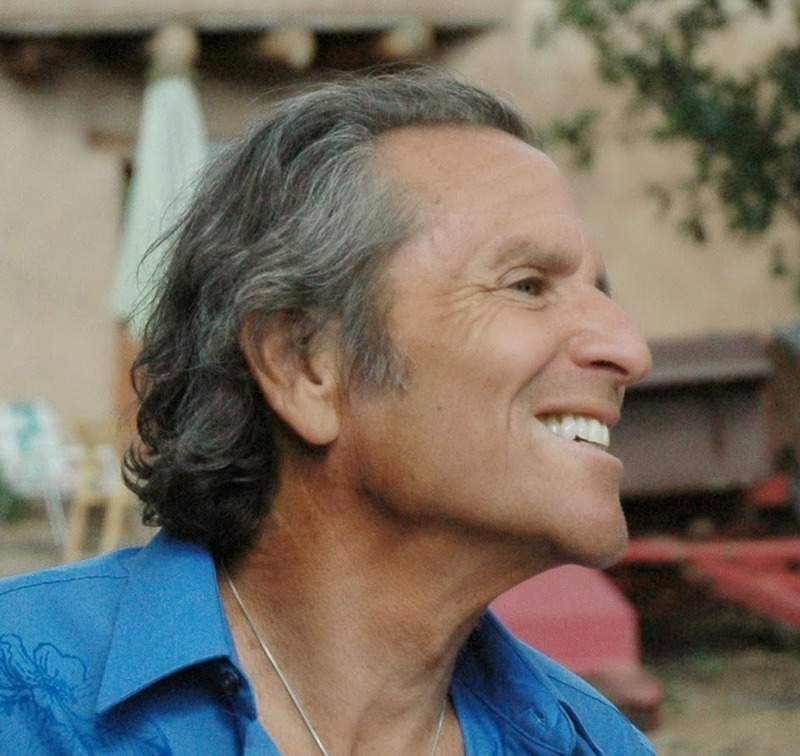 Barry I. Buchman argued the cause for appellants. With him on the briefs were Scott D. Gilbert, Natalie A. Baughman, and Emily P. Grim. Alan Burch, Assistant U.S. Attorney, argued the cause for appellee. On the brief were Ronald C. Machen Jr., U.S. Attorney, and R. Craig Lawrence and Michelle Lo, Assistant U.S. Attorneys. Before: HENDERSON, ROGERS and KAVANAUGH, Circuit Judges. 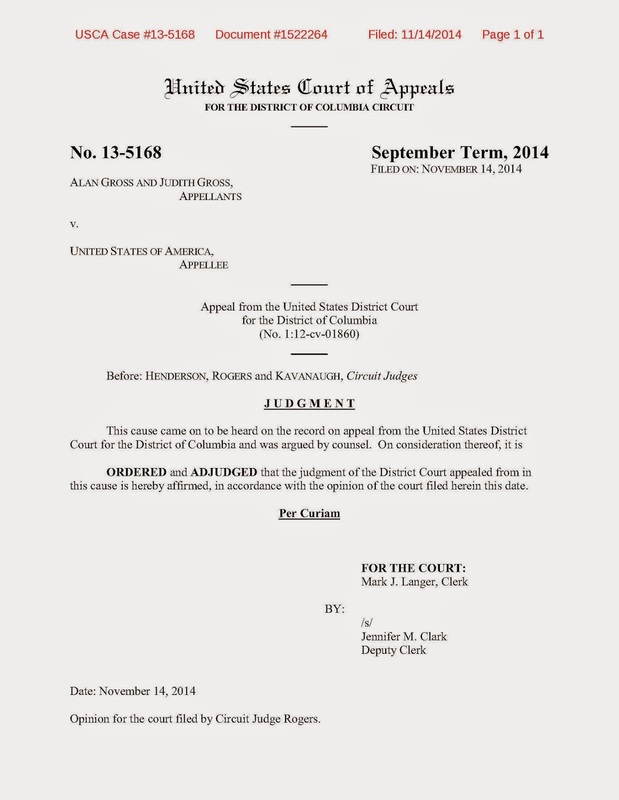 ROGERS, Circuit Judge: The Cuban Liberty and Democratic Solidarity (Libertad) Act of 1996, Pub. L. No. 104–114, 110 Stat. 785 (1996) (codified at 22 U.S.C. § 6021 et seq. ), aimed “to assist the Cuban people in regaining their freedom and prosperity, as well as in joining the community of democratic countries that are flourishing in the Western Hemisphere.” Id. § 3, 22 U.S.C. § 6022(1). The Act authorized the President “to furnish assistance and provide other support for individuals and independent nongovernment organizations to support democracy-building efforts for Cuba.” Id. § 109, 22 U.S.C. § 6039. In that regard, the United States Agency for International Development (“USAID”) entered a contract with a private consulting firm, Development Alternatives, Inc. (“DAI”), to provide humanitarian support to groups within Cuba. 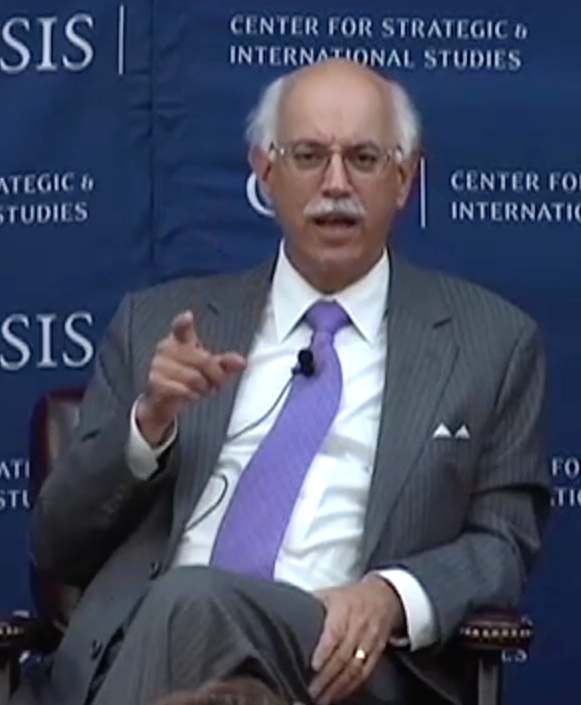 DAI, in turn, contracted with Alan Gross to train the Jewish community in Cuba to use and maintain information and communication technologies, such as mobile phones, wireless technologies, and personal computers. As his fifth trip to Cuba was drawing to a close in December 2009, Mr. 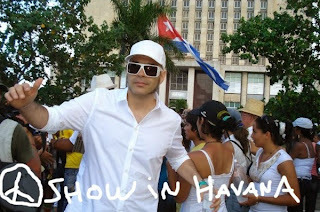 Gross was detained and interrogated by Cuban authorities. In 2011, he was convicted for his participation in “a subversive project of the U.S. government that aimed to destroy the Revolution through the use of communications systems out of the control of [Cuban] authorities” and sentenced to fifteen years’ imprisonment. Compl. ¶ 115 (alteration in original). TED is a nonprofit aimed at "spreading ideas, usually in the form of short, powerful talks (18 minutes or less). TED began in 1984 as a conference where Technology, Entertainment and Design converged, and today covers almost all topics — from science to business to global issues — in more than 100 languages." The event in Cuba is an independently run event. The organizer is listed as Andrés Levin. His profile describes him as a "producer, composer, film maker, musician, philanthropist, creative director, and Grammy winner." The LA Times called him "the master chef of urban fusion." 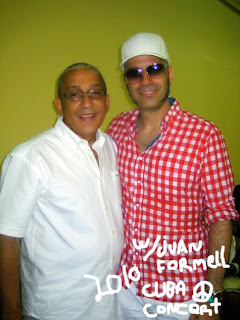 Andres Levin is one of the best and most versatile producers in the Latin alternative world. He's got so much going on you can't tell where one style begins and another rhythm ends. He's a brilliant producer, songwriter and multi-instrumentalist.